Discount available! Recommend Electronics kit of 3D Scanner to your friends and get your Discount. Set containing all the electronics needed to make a 3D scanner,Raspberry Pi 2 Type B board, two LASER line, a color camera with adjustable lens, a stepper motor driver and one shield, a DC / DC converter module, power supply 12 Vdc 2A, a micro SD card 4GB, Flat-cable 18-pin socket and a DC-power terminal. Our 3D scanner comes from an evaluation of the open project PiClop consists of a mechanical (of which the parts to be printed in 3D are discharged from www.thingiverse.com ) and electronics formed by the Raspberry Pi 2 card and his camera . Compared to the original design we have replaced the Raspberry Pi camera with an adjustable optical equipped and we used a shield for the stepper motor management (NEMA 17) that rotates the plate and of the LASER. The Raspberry Pi camera with adjustable lens allows you to optimize the focusing on the subject. Being able to precisely adjust the focus, we are able to get the best definition in the calibration phase, before you start scanning. The IR camera is a 5MP for Raspberry Pi, with 3.6-mm adjustable optics. The management of all functions, as well as the parameter settings, is via LAN, then can also be made remotely, through any computer. The Raspberry Pi (must be version 2) and in the kit include a SD-Card with the image of the operating system with the management and control software can generate 3D files in the following formats: PLY - Colored Point cloud, XYZ - Comma Delimited 3D Point Cloud, STL - 3D Triangle Mesh. N.B. the package does not include any mechanical parts and plastic parts to be downloaded (www.thingiverse.com) and print using a 3D printer. - It requires less computing power for the construction of the three-dimensional model. To capture the object's shape, our system performs a superficial analysis of the same, causing it to rotate on a plate or fraction of a degree at a time while he is pointed at a linear laser light; The laser projects vertical lines covering the entire height of the object to be scanned and the reflected light reaches a camera that captures the resulting images and passes the appropriate software. To acquire all the necessary information, the object is rotated by an angle at the discretion, although normally it makes a full rotation (360 degrees). 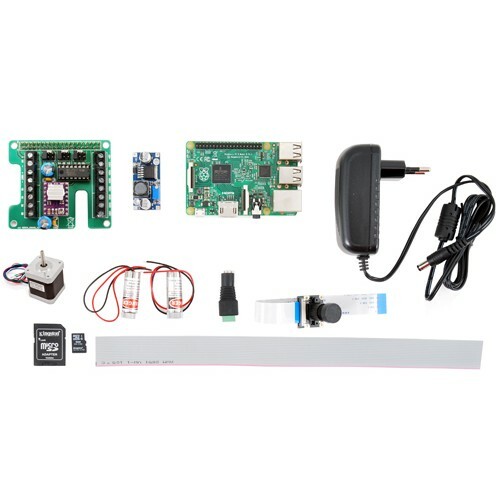 The program allows you to determine how many steps must carry the motor NEMA 17 for a full turn (360 °) until 6400; our stepper-motor is 200 steps / rev and piloted with the shield, makes a step every 32 pulses on STEP joints from Raspberry Pi 2; then step 200 multiplied by 32, are 6.400. The linear beams of laser are mutually inclined, in the horizontal plane, of 60 degrees, then the camera, being centered with respect to the two LASER, is at an angle of 30 ° with respect to the beam of each. The scanner must operate in a not excessively lit environment, so that there is a clear contrast between the area affected by the line of each laser and the object surface to be scanned. When you start scanning, the Raspberry Pi 2 starts recording images (frames) provided by the camera, with a periodicity set by the software: the default is 800 per full turn of the plate and then the object, but we have tried to work even with 2,000 frames / rev. The need to adopt a second LASER arises when you have to scan for example a cube: in this case, in fact, only using a LASER are created some shadow areas due to the misalignment (ie of the different angle with which the two elements turn the piece to be scanned) between the camera and the laser. In the specific case, since the two on the same axis, during rotation there are areas in which the beam is obscured by one of the walls and does not reach the camera, preventing to perceive the reflected beam and therefore causing "holes" in the acquired model . If we add a second LASER phase shifted by 30 degrees in the direction of counterclockwise rotation, the shadow areas disappear: in fact, when the object rotates exceeding the critical angle of the first laser, the shadow area is scanned through the second LASER. For the acquisition of objects that do not have these facets to hide the laser line to the eye of the camera, you can use it to scan, only a LASER. Let's see how the acquisition takes place: in each frame tripped, is considered to be the reflection of the laser line, which is vertical and is a thin slice of the surface; at each rotation you are then obtained one frame with an illuminated slice falling in an always different position, up to complete the desired surface. The Raspberry Pi 2 analyzes, for each frame, the lit area, discarding the rest of the image, it needs just to check the correct sequence of queuing of slices; putting together the slices you rebuild the image. The software implements a web interface, through which we can work with your scanner, or make settings and acquisitions. For each capture file is generated. Support for manual movement of the turntable.